SSDs’ caching further increases this divide. 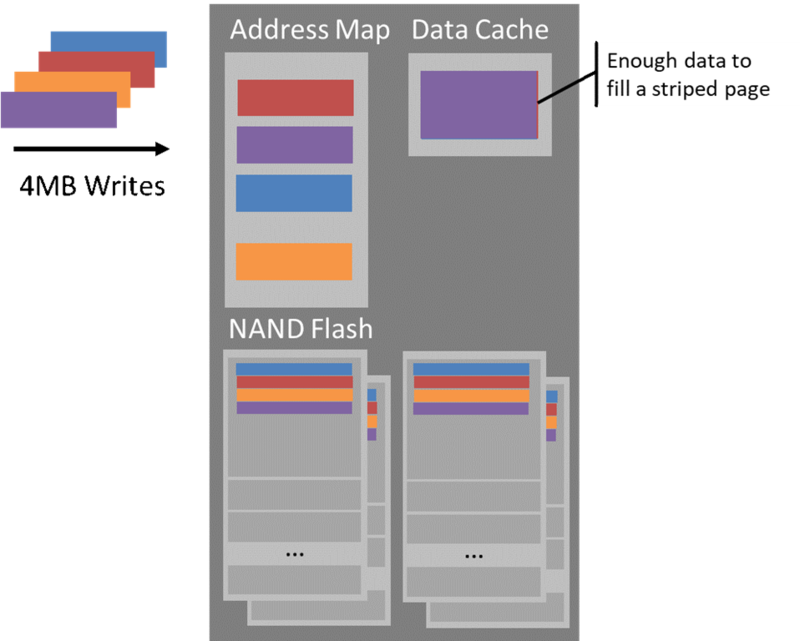 To make the best use of the SSD’s parallelism, its controller collects enough writes to fill one flash page in every plane, about 4MB in our current drives. If the data comes from multiple applications, the drive mixes their data in a way that is difficult to predict or control. This becomes a problem when the device performs garbage collection (GC). By this time, some applications may have freed their data, or updated it at a faster rate than other applications. For efficient GC, the ideal is to free or update the data on a single block. 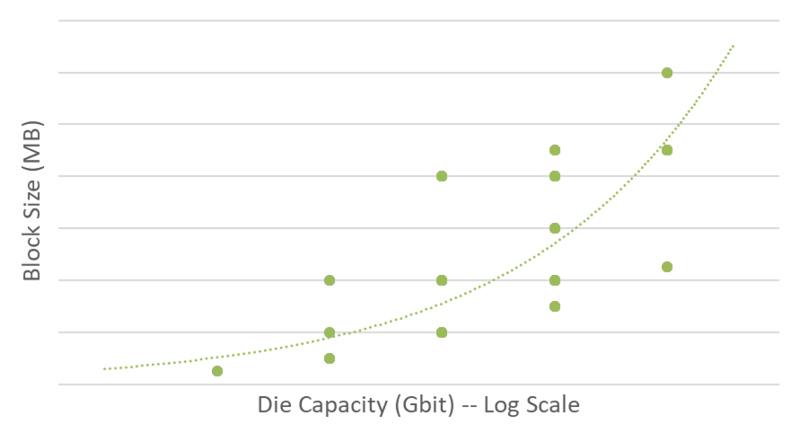 But when caching brings the effective block size to 1GB, it’s very unlikely that the host can issue enough data to the drive for one tenant before servicing writes for the next tenant. 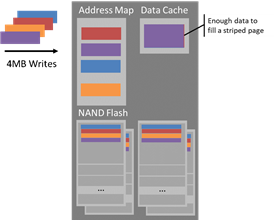 This caching design can also be viewed as an optimization for a single workload: sequential writes. It’s not surprising for SSD makers to target this workload – optimizations for HDDs aim to make workloads sequential, and sequential writes on SSDs are consistently 4-5x faster than a workload of random writes (on a completely full drive with 7% OP). However, real-world cloud a pplications rarely consist of writes that are purely sequential on the whole drive. Much more common are workloads consisting of hundreds of sequential write streams per TB of storage. Media managers are written for a specific generation of media, and implement algorithms such as ECC, read retry and data refresh in accordance with the physical properties of the media such as the patterns of where and when errors arise and data retention times. These two components appear in many places. 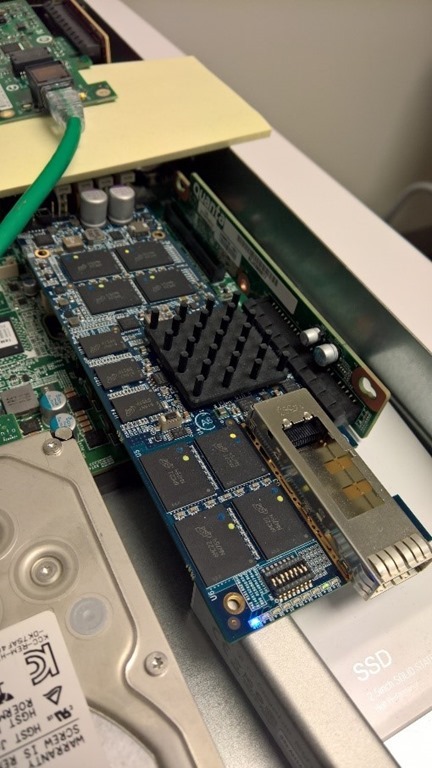 Standard SSDs mix both, and early open channel architectures require the host to implement both. 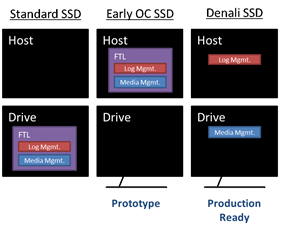 Most systems have at least two or three log managers stacked on top of each other – a scenario SanDisk warned against in their paper, Don’t Stack Your Log on My Log. 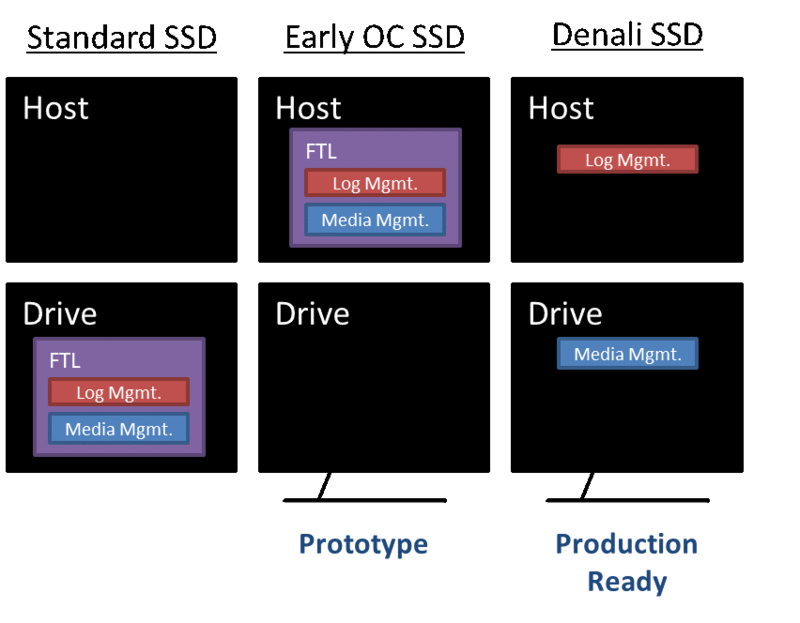 In Project Denali, we propose a clear division between log and media managers, with placement of the media manager in the drive, and a single log manager encapsulated entirely in the host.